The last time Megan Crane was here, she took us back in time. 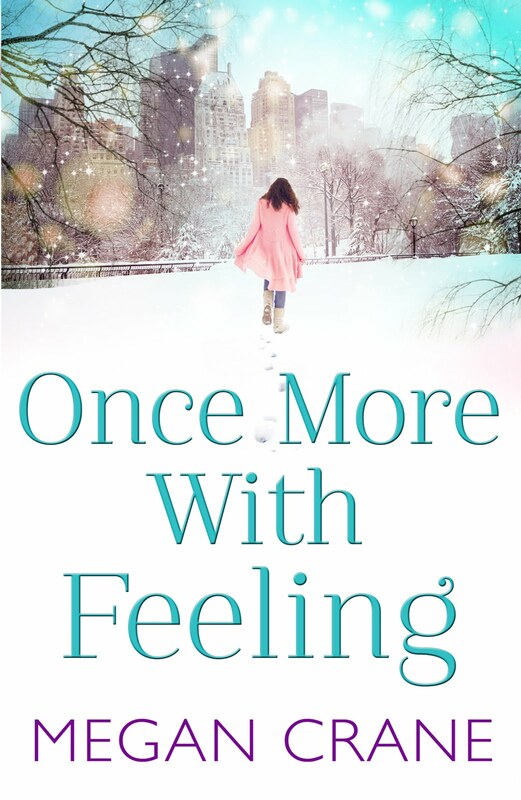 With the holiday season in full swing, she's here for the present (we're talking time here) to talk about her latest novel, Once More with Feeling, and winter holidays, of course. The cover of her latest novel is perfect to put us in a winter mood with all the glistening snow on the ground and the New York skyline as the backdrop. So settle by the fire with a cup of hot cocoa and check out what she has to say. This New Jersey born author lives with her husband, dog and cats in L.A. and also wrote I Love the 80s, Names My Sisters Call Me, and Frenemies, just to name a few. 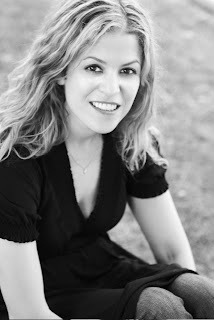 Her romance novelist alter-ego is Caitlin Crews, who has been seen at many romance writer conferences with Jane Porter. 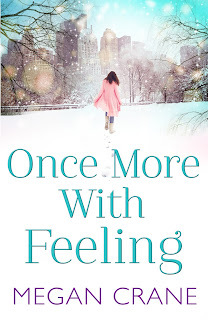 As an actual present, Megan has one copy of Once More with Feeling to share with a lucky reader anywhere in the world! You can find Megan at her website and blog, as well as Facebook and Twitter. Once More With Feeling is a story about what happens when everything you believe shatters, and what you do to figure out how you ended up there. It's about going back and taking a good hard look at the choices you made along the way. I wanted to write about choices, how and why we make them, and the tension between safety and risk. I really loved this story, so I hope readers do, too! What’s the most interesting comment you’ve received about any of your books? I found a question somewhere; someone had read my book I Love the 80s and had looked everywhere for one of the Wild Boys albums, and (of course) couldn't find any of them. They wanted to know where they should look. I answered and said I was the author, and I'd made them up--and my response was 'disliked.' Ha! I get to my desk pretty early and check email etc. while I have my tea, and then I try to get down to work by 9:30. My days are much, much better if I get some serious work done before noon. I usually have some kind of deadline, and if it's far enough away I try to write 2000 words a day. If it's closer and I'm panicked, I try to write as much as possible. My goal in life is always to have evenings and weekends free to read, relax, watch TV, see my husband and friends--but that's not always doable. I try! What is your favorite winter holiday themed movie? It's a toss up between Home for the Holidays and Love Actually. What gets you into a winter holiday mood? Cold weather and Christmas carols! What is the best winter holiday gift you have ever given or received? I like Thanksgiving meals, prepared with love and shared with loved ones. That's the best gift! See above. I'm actually answering these questions on Thanksgiving morning, and my stomach is already rumbling in anticipation! Special thanks to Megan for a fun chat and sharing her book with our readers. 1. Please tell us: What gets you into a winter holiday mood? Giveaway ends December 11th at midnight EST. Cant wait to read this book! I met Megan in Sept at a library event in my town. She is such a fabulous and fun lady! I love everything about the holidays, but especially reading any kind of chick lit and holiday books! i like to make sure we have plenty of hot chocolate on hand, embrace the colder weather, decorate the house, bake some goodies and start wrapping gifts early. every year, my boy and I go see the national tree after it has been lit, i like taking one night each season and just enjoying the simplicity of going to see a tree. The beautiful carols the local church bells play throughout the neighborhood, the Christmas lights, the United Way Christmas tree decoration contest, all make me have the holiday spirit. Congrats Megan the book sounds fantastic! I get the the mood with Love Actually and Mariah Carey's All I want for Christmas song. Love it. The book sounds great. I follow this blog and love it. What gets me in the holiday mood: I think it is my daughters excitement. I get so overwhelmed with the MESS of getting set up for christmas, but they get SO excited. oh: forgot my email address! Looking forward to reading this! Hot chocolate and baking some cookies helps me get into the holidays! -I follow via gfc- Kirsten! When I see the houses on my street lit up with lights then I am in a holiday mood. I love to see Christmas trees and Santa Claus set-ups in the malls. 1. Listening to Christmas music gets me in the holiday spirit. I really love Michael Buble's Christmas CD. Christmas lights really get me going and in the holiday spirit. Seeing those first houses with lights up always gets me pumped for the holiday! Luckily, lots of people put their decorations up early! I follow CLC on FB, Twitter and through GFC. All the lights and the music and the ice-skating - it all gets me so excited about this time of year! btw - I love that Megan shared her schedule and morning routine! So inspiring. Curling up with a good Christmas book puts me in the mood. 1.Decorating the tree!!! Especially if its snowing, which it usually is! Listening to Christmas music and watching Christmas movies get me in the winter holiday spirit. the cold weather...and christmas music/decorations...get me in the christmas mood. Yay! I am so thankful that CLC is doing an international giveaway for this book! Thank you Megan Crane! And congratulations on publication day! 1.When the temperature starts to fall, I know the holidays are fast approaching, and I start seeing eggnog at the grocery store and I know the winter holidays are almost here! 2.I follow the blog. I get e-mails daily. 4.I'm in the group on facebook. I would LOVE to win this book. I <3 Megan Crane! My kids definitely get me in the holiday spirit. It's all about them! I just read a great review for this book earlier tonight and ordered it. It is perfect timing to find out more about the author at the same time. It's hard to know it's winter when it's 75-80 degrees outside. I watch a ton of Hallmark movies to get into the holiday spirit. Christmas Carols always gets me in the spirit of the Holidays. I shared on fb, and I am a follower and part of the group. Snow on the ground and baking Christmas cookies gets me in the holiday mood! I have really enjoyed Megan's previous books and can't wait to read this one. I like to drive around and see the holiday lights, that always gets me in a holiday mood. Christmas music always does it for me! If I don't win I hope this becomes available in the US very, very soon. Thanks! Christmas music puts me in the Christmas mood!! This book sounds like a wonderful read! Reading Christmas themed books and watching holiday movies puts me in the Christmas spirit! Doing fun things with the family and then having hot chocolate! To get in the holiday mood...cold weather, snow, baking cookies, buying presents, advent candles at church, Christmas music. I follow the blog, Twitter, Facebook, and Pinterest! You guys are awesome! What doesn't get me in the Christmas mood? But I especially love snow, decorations and Christmas music! This books sounds GREAT! I think I need to go read I Love the 80s. I think I would love that book! I follow via email, twitter, pinterest and Facebook! I begins with the food. Out come the recipe books. Can't wait to read this book. I love the holidays - the decorations, baking, music, the warm feelings, family, the tv movies, books. Reading holiday books and watching movies gets me in the spirit! Snow is what´s puts me in a Christmas mood. Loved the interview. And can´t wait to get my fingers on a copy of the book. Can't wait to read this. I love all of Megan's books! twalsh@mwalsh.net I met Megan and got to hang out with her back in September at one of Jane Porter's book launch events. She is so much fun to talk with and get to know. I have all of her other books and can't wait to get my hands on a copy of this one. I follow her on Facebook. I´m a follower on fb, pinterest, GFC and twitter. Finishing ordering presents for my daughters puts me a holiday mood because I can't wait to give them to them. Thanks to Megan for visiting with us and sharing her book with our winner. We assigned each entry a number (only from those with contact info) and random.org chose one winner.